Gmail is one of the most important Google services. Despite all the social networks around, many people still use mail as their main mean of communication. That’s why we treat it as a part of the phone and often forget it’s a standalone app. Well, until some problems arise. One of the most common Gmail problems is the syncing issue. And I assume you’re experiencing this problem right now, as you’re reading this article. So, check out the following solutions, and I hope you’ll resolve the problem. Although not necessarily a solution to the syncing problem, keeping the Gmail app (and all other apps) up to date is essential for it to work flawlessly. And who knows, maybe there’s some interference inside the app’s code that will be resolved with an update. So, head over to the Google Play Store and update Gmail. Gmail uses Google’s servers to deliver new emails to your Inbox. So, if the server is down, naturally, you won’t receive the new mail. Before moving on to other solutions, check the G Suite server status. If you find out that the server is down, don’t worry, because Google will probably fix the problem soon. You can check the G Suite server status here. And now, on to your favorite solution. I know clearing the app cache and data has become an unpopular solution because of its cliché status, but it may be helpful after all. Head over to Apps or Apps Manager (depending on your phone). If you can’t find it, simply search for installed apps in the Settings search bar. Locate Gmail in the Apps Manager (if you can’t find it, choose Show all apps or Show system services from additional settings). 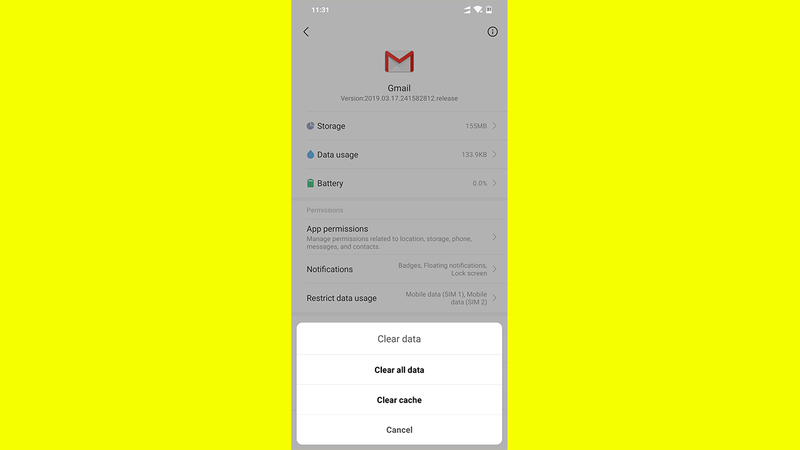 Tap Gmail and choose Clear cache. If clearing the cache doesn’t resolve the syncing problem, repeat the procedure, but this time choose Clear data. Just keep in mind that clearing the app’s data will erase everything, so you’ll have to set up Gmail on your phone once again. There are numerous settings that may interfere with the Gmail app, thus preventing it from receiving new emails or syncing. So, you’ll need to tweak these settings to make Gmail function again. As you probably know, airplane mode drastically restricts the level of communication your device can establish. Meaning there are no calls or the internet connection in the airplane mode. Sure, you won’t have this mode enabled all the time, but as it’s most commonly placed in the top settings panel, accidental taps may occur. So, disable airplane mode and check Gmail once again. If your phone has the data saving feature, it will limit the performance of almost every app when you’re not connected to WiFi. There are two solutions in this case. You can either whitelist Gmail in data saver, or only receive new emails when you’re connected to WiFi. Sure, whitelisting Gmail will eat up more data, but Gmail itself is not a data-hungry app, so you won’t have to worry about it. Just make sure not to open any media-heavy emails. Tap Network & Internet > Data usage > Data saver (this step may differ on your phone). Find Gmail and toggle it on. Obviously, if you’re not properly connected to the internet, Gmail won’t work. So, make sure you don’t have any internet connection problems. If you notice a certain problem, check out this article for additional solutions. Tap the menu button in the upper left corner. Go to Settings > account (your email address). Make sure the Sync Gmail option is enabled. That’s about it. I hope at least one of these solutions helped you resolve the Gmail syncing problem on your Android phone. If you have any comments, questions or suggestions, just write them down in the comments below.